Hey, Everyone! It’s Cathy from Lemon Tree Dwelling, back with another delicious summer recipe to share with you! If you are anything like me, your summer is flying by….jam packed with sports and activities and birthday parties and playdates….and at the end of the day, the LAST thing you feel like doing is cooking! Lucky for me, my family is big on sandwiches, and as long as I keep them interesting, they’ll keep on eating them. One of our favorite “go-to” sandwiches is tuna melts….but since we typically love tuna melts with tomato soup, it’s a little hard to enjoy them in the heat of summer! So I decided to take one of our favorites and re-make it, summer style. 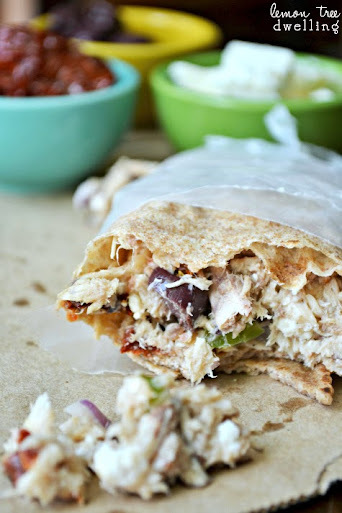 We LOVE all things Mediterranean, especially in the summer….and let me just tell you, Mediterranean + tuna = delicious!! 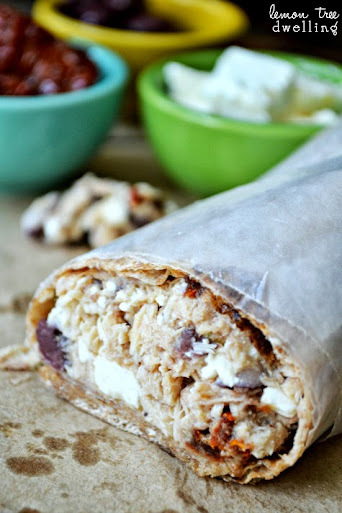 I used so many of my favorite ingredients in this Mediterranean Tuna Wrap – olive oil, feta cheese, sun dried tomatoes, kalamata olives, and fresh veggies – mixed them with albacore tuna, and wrapped them in a whole wheat tortilla. The result was not only de-LICIOUS, but it was also incredibly healthy! 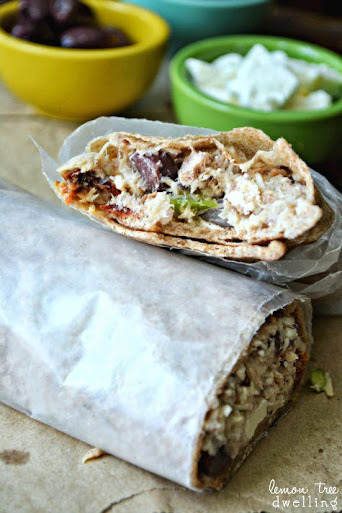 So much lighter than your typical mayo-based tuna salad….and I must say, much tastier, too! Perfect for jam-packed summer days or ANY day when cooking is just not an option. 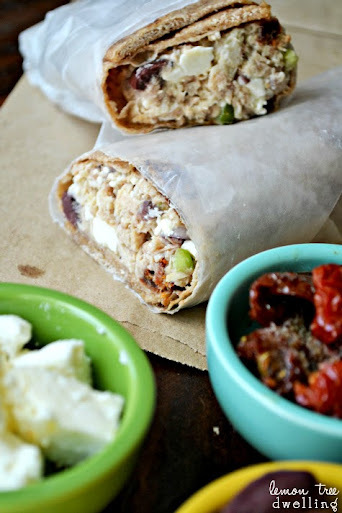 In a small bowl, combine tuna, olive oil, red onion, green pepper, olives, sun dried tomatoes and feta cheese. Stir to combine. Fill tortilla, roll, and cut in half. I hope you enjoy this recipe as much as we did! I’d love for you to stop by Lemon Tree Dwelling and check out a few of my other summer recipes – Pesto Avocado Melts or Tropical Spinach Salad, anyone? Thanks so much for having me here today, and I look forward to being back with you again next month! This looks really yummy. I never thought to use tuna in a mediterranean recipe. I have pinned it and plan on trying it. Thanks. Oh man, this looks incredible. My husband could eat tuna for every meal, this is such a fun twist on the traditional tuna salad!